Violence broke out as thousands of illegal immigrants from Eritrean gathered on Friday at the Tel Aviv Convention Center to celebrate 25 years since their country gained independence. The event, which was organized by the Eritrean embassy in Israel, drew supporters of the Eritrean government, while opponents of the current regime protested outside. Witnesses say brawls between pro- and anti-government Eritreans broke out near the entrance of the Convention Center. 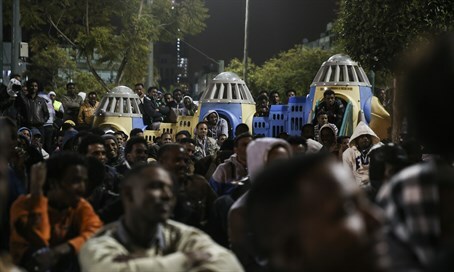 Yonatan Jakubowicz, a senior official at the Israeli Immigration Policy Center, said the event highlights the close ties most Eritreans maintain with their home country, and dispels claims that they are asylum seekers who fled to Israel out of concerns for their safety. Jakubowicz noted that most Eritrean citizens living in Israel even paid a 2% income tax to the Eritrean government, in return for certain services. “It’s time to end this bluff once and for all that the illegal immigrants from Eritrea are asylum seekers. The overwhelming majority of them are migrant workers who keep close ties with their families and native country, and even participate actively by the thousands in events organized by their home country’s embassy,” said Jakubowicz. Tens of thousands of immigrants from Eritrea have infiltrated Israel over the past decade. While some have been returned to their home country, the majority have stayed, claiming that they are refugees seeking asylum and that their lives would be at risk if they returned home. While some on the Israeli left have called for the normalization of most of these illegal immigrants, many on the right have argued that the overwhelming majority of asylum seekers are in fact migrant workers looking to benefit from higher wages and Israel’s generous welfare system. Hi everyone! Life without my boyfriend was a real mess for me,What on Earth will i do to thank Dr.Unity for his help? he is wonderful and has a good heart. He is like a God on Earth and i really do not know what to do to thank him for helping me regain my boyfriend love back with his spell. After being in relationship with my boyfriend (Andrew) for 3 years, he broke up with me, I did everything possible to bring him back but all was in vain, I wanted him back so much because of the love I have for him, I begged him with everything, I made promises but he refused. I explained my problem to someone online and she suggested that I should rather contact a spell caster that could help me cast a spell to bring him back but I am the type that never believed in spell, I had no choice than to try it, I mailed the spell caster, and he told me there was no problem that everything will be okay before two days, that my ex will return to me before two days, he cast the spell and surprisingly in the second day, it was around 4pm. My ex called me, I was so surprised, I answered the call and all he said was that he was so sorry for everything that happened, that he wanted me to return to him, that he loves me so much. I was so happy and went to him, that was how we started living together happily again. Since then, I have made promise that anybody I know that have a relationship problem, I would be of help to such person by referring him or her to the only real and powerful spell caster who helped me with my own problem and who is different from all the other ones out there. Anybody could need the help of the spell caster, like of issue of not being able to get pregnant for many years, lotto, his email is: Unityspelltemple@gmail.com or call him on +2348072370762 you can email him if you need his help in your relationship or any other problem like wining lottery your problem can never remain the same again, it will turn a thing of the past in your life..I am Katy Brown from United States.